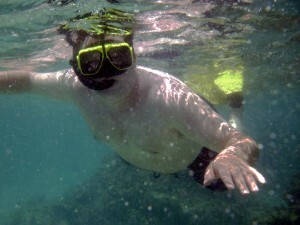 So we had an absolutely FABULOUS time on vacation… one of the highlights for me (other than my brother getting married) was snorkeling in Aruba with my underwater digital camera. The camera picked up so many things I couldn’t see – it is truly amazing. Aruba apparently isn’t the best place to go to snorkel, but it sure was fun. If you follow this link, you can see all the pictures and video I was able to take. I was able to get a very nice picture of a rather large fish, as you can see above . P.S. I updated the link today so that the pictures remain centered no matter what your settings on the computer are (I think). I also added some commentary to identify several of the fish that I have been able to identify. This entry was posted on Sunday, April 25th, 2010 at 7:47 AM	and is filed under Family. You can follow any responses to this entry through the RSS 2.0 feed. You can leave a response, or trackback from your own site.